This item was introduced in E-Prime 2.0 (2.0.10.193). 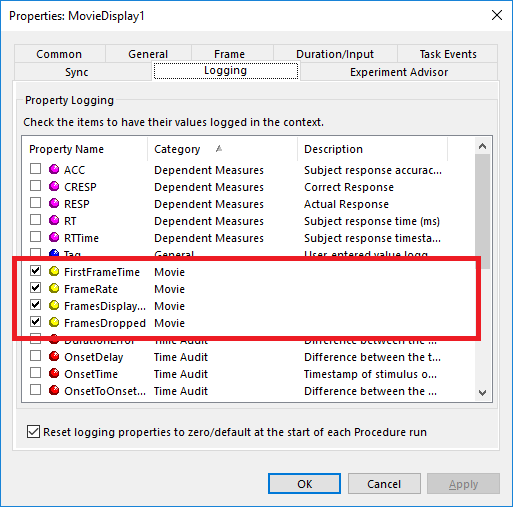 The MovieDisplay logging properties FirstFrameTime, FrameRate, FramesDisplayed, and FramesDropped are checked by default. These properties can be unchecked by navigating to the "Logging" tab of a MovieDisplay and unchecking the properties. In the edat file for my experiment, the logged 'FirstFrameTime' is sometimes negative, and 'FrameRate' is sometimes 0 (sometimes both, not always). Can you say more about what this means?